Businesses depend on InstanSign for turnkey trade show exhibit systems complete with colorful custom graphics and convenient cases for easy transport. Choose from three different modular systems or combine elements to create a unique display. Use unique trade show graphics, trade show boots and trade show exhibits to create high-impact for your business. ·Banner Stands are the quickest and easiest way for your company to display at trade shows, conferences or meetings. Perfect for lobby messages, point-of-sale promotions and new product introductions, the Banner Stand systems offer modular design and changeable panel inserts for unlimited design freedom - all at an affordable price. 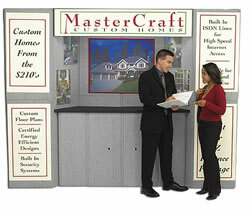 ·The unlimited design flexibility of the panel displays sets your business apart, even on a crowded trade show floor. This frameless, back-wall panel system offers a back-lit header, lights, radius end caps, modular counters, and wheeled, interlocking cases of molded plastic. Removable spines allow a single system to be used as either a freestanding floor exhibit or a tabletop display.